Another Friday, another challenge at QKR Stampede. We always have an "Anything Goes" theme but we also give you an optional twist if you want to use it and this week is pretty easy - "Halloween" - and it's right around the corner. Next Tuesday, in fact. I used the twist this week and made this spooky Halloween card using the "Witch - 19605 " image and "Boo - 12902" sentiment, both from QKR. especially running my diagonal differently. I used my ProMarkers to color the witch and then tore the paper on which she had been printed. I curled the left hand side of it. I added some sparkle to her skirt with a bit of loose glitter. Then, I die cut the cat (Unbranded Die) from sparkly, glittered CS and added it to the broom. He's mounted on dimensional tape but that doesn't show up very well in the photo. Instead, he looks more like part of the image but he's a totally separate piece. I dug through my paper scraps and found the papers I used on the background, then added the polka dot ribbon, the orange bow, and the little groupings of gemstones. Finally, I printed the sentiment, tore the edges around it and added it to the lower corner. Fabulous image and love the cat Connie, have a great weekend. How FUN!! So glad that you join the fun over Simon Says Stamp Wednesday “Anything Goes” Challenge! Awesome details and design! Super work! What a fun creation Connie! Thanks so much for joining us at The Sisterhood’s ‘I See Spots’ challenge and please come back again soon! 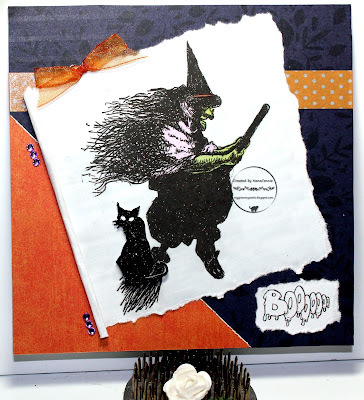 Love your card and just the right amount of coloring on the witch. Have a restful weekend! An AMAZING card, LOVE LOVE LOVE the image, this speaks to me of Halloween. As SUPER card. The subtle coloring on your card is perfect - really adds to the overall spooky effect! Great take on the sketch! And I love all the sparkle from the glitter and rhinestones! Thanks for playing with The House That Stamps Built.